The iPhone is different from most of the phones on the market as it is coded differently, slimline in performance and interacts uniquely with the user. 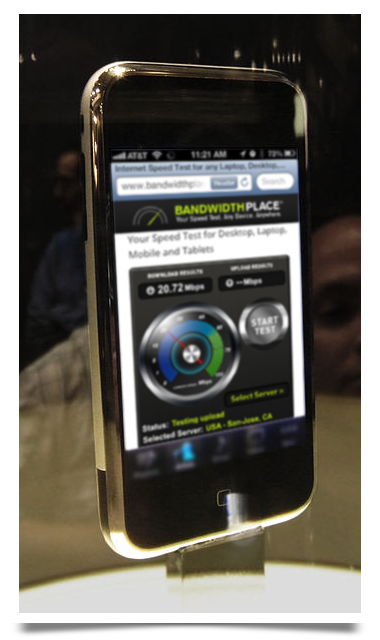 BandwidthPlace, the perfect place to perform an iPhone speed test, is different from most sites as it is streamlined using HTML5. It doesn’t require any apps of Flash to bring the user the best mobile speed test readings. When connecting to the Internet, the iPhone will first check with the user’s WiFi network. If that is not available, the device will search for any other available network. Once the iPhone finds a network, then the user simply has to tap the connection to join the network. If the network is secured, the user may need to enter a password in order to access the network. If the user cannot, or does not, want to join a WiFi network, then a cellular data network may be accessed as long as the iPhone is a cellular model. In order to connect to a cellular data network, the user must have an active phone or data plan with a wireless carrier. Users that wish to use a different carrier’s network must turn on Data Roaming. This can be achieved by going into “Settings,” selecting the “General” option, and then selecting the “Cellular” option. Doing this will most likely incur roaming charges from the carrier. Once the user has connected to the cellular data network, a speed test may be run at the Bandwidth Place site. At the site, the user has two options: tap on the green “Start” button and quickly get download and upload speeds or select the server by tapping the “Select Server” down arrows. Once the server is selected, tap the “Start” button for the results. A user may think that the cellular data network is a bit slow, which is probably true. WiFi is a faster technology, and the user will be able to see the difference between WiFi and the data cellular network when performing an iPhone speed test at BandwidthPlace.